Hi friends, in this article, I am going to discuss about types of concentrating solar collectors and hope you will find it useful. Solar power is a conversion of sunlight into electricity. The amount of solar energy reaching the earth’s surface is huge – almost 6000 times more than the power consumed by humans throughout the world. There are two systems of converting sunlight into electricity. 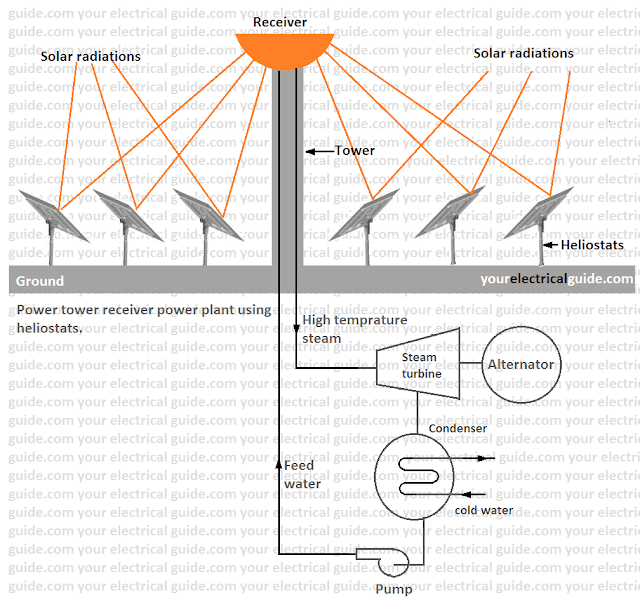 Concentrated Solar Power System (CSP). The concentrating solar power system (CSP) uses lenses or mirrors to focus sunlight into a sharp beam with the help of concentrating solar collectors. This powerful beam is next focused on a small receiver to heat a fluid to a high temperature. The hot fluid is then used to generate steam that drives a steam turbine coupled to an electrical generator. It is a line focusing type collector. In this type of collector, the solar radiations falling on the area of the parabolic reflector are concentrated at the focus of the parabola. When the reflector is manufactured in the form of a trough with the parabolic cross-section, the solar radiations gets focused along a line. An absorber pipe is placed along this line and a working fluid (usually synthetic oil or water) flows through it. When the focused solar radiations fall on the absorber pipe, it heats the fluid to a high temperature. Then the heat absorbed by the working fluid is transferred to water for producing steam. The focus of solar radiations changes with the change in sun’s elevation. In order to focus the solar radiations on the absorber pipe, either the trough or the collector pipe is rotated continuously about the axis of the absorber pipe. 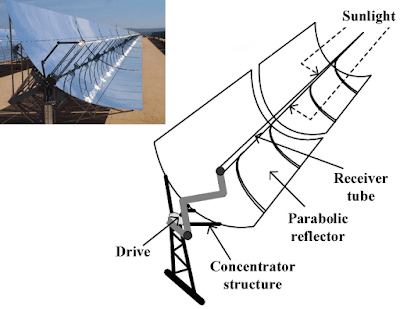 These power plants employ an array of parabolic trough collectors installed with sun tracing device to collect the solar radiations which are used to heat a fluid (water). The general range of working temperature is between 250oC to 400oC. This heat is transferred to a storage tank and finally to feed water where the steam is generated in the steam generator. 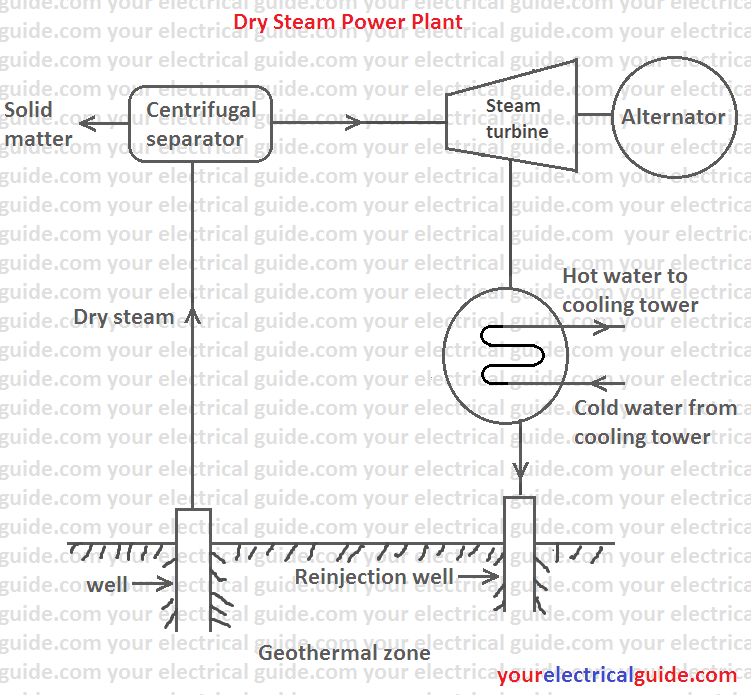 This steam is used to drive a turbine coupled to an electric generator. The mechanical energy produced by the turbine is converted into electrical power by the generator. The exhaust of the steam turbine is condensed in the condenser with the help of circulating cold water. The condensate is returned to the boiler with the help of a feed pump. The parabolic trough collectors are generally preferred over dish collectors because of low cost and requirement of sun tracking in one plane only. The system works on the Rankine cycle. 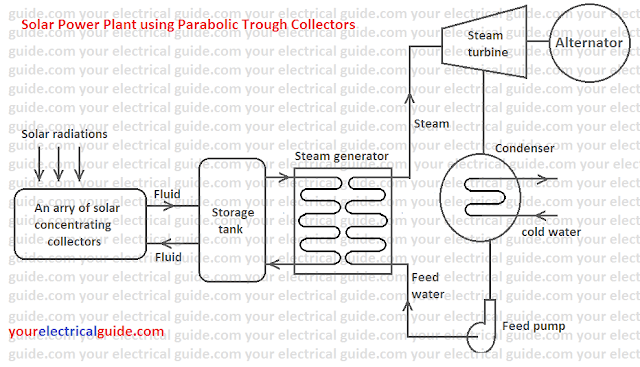 The block diagram of the power plant using parabolic trough collectors is shown in Figure. In this collector, the receiver is located at the top of the tower. It has a large number of independently-moving flat mirrors (heliostats) spread over a large area of ground to focus the reflected solar radiations on the receiver. The heliostats are installed all around the central tower. Each heliostat is rotated into two directions so as to track the sun. The solar radiations reflected from heliostats are absorbed by the receiver mounted on a tower of about 500 m height. The tower supports a bundle of vertical tubes containing the working fluid. The working fluid in the absorber receiver is converted into the high-temperature steam of about 600oC – 700oC. 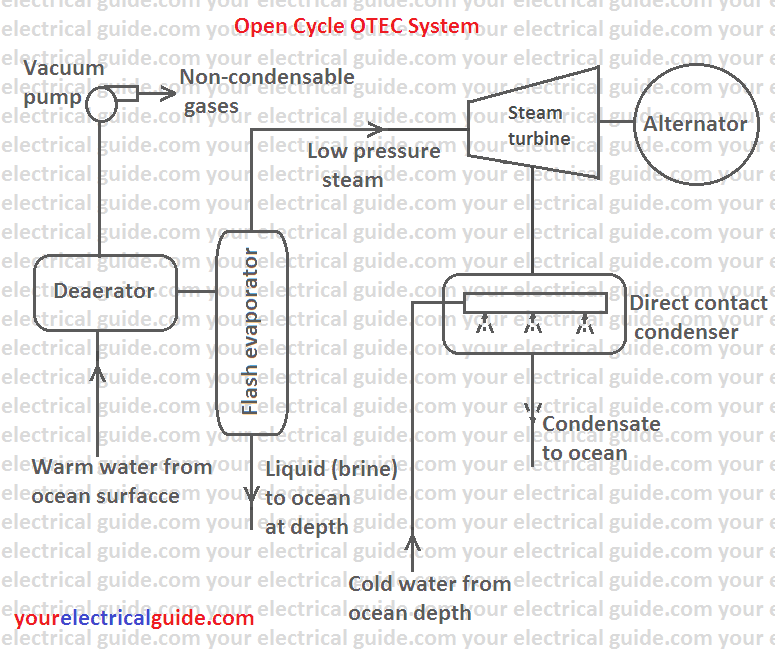 This steam is supplied to a conventional steam power plant coupled to an electric generator to generate electric power. In these collectors, the receiver is placed at the focal point of the concentrator. The solar beam radiations are focused at a point where the receiver (absorber) is placed. The solar radiations are collected in the receiver. A small volume of fluid is heated in the receiver to a high temperature. This heat is used to run a prime mover coupled with a generator. A typical parabolic dish collector has a dish of 6 m diameter. This collector requires two-axis tracking. It can yield temperatures up to 3000oC. 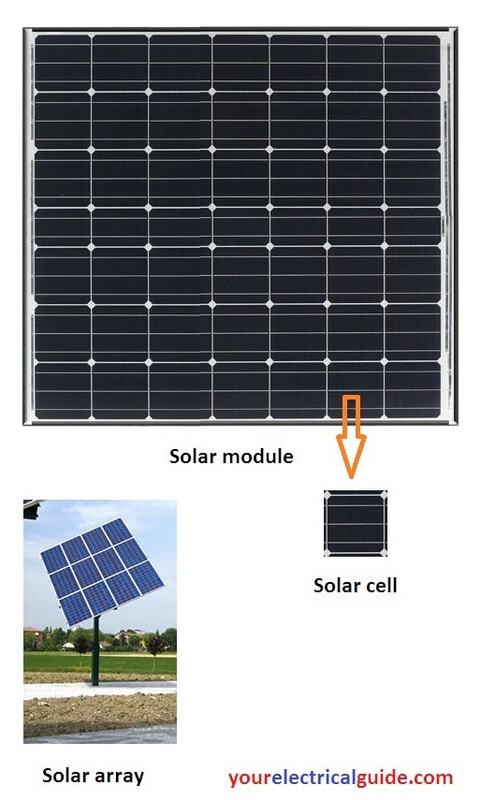 Due to the limitations of size and the small quantity of fluid, dish type solar collectors are suitable for only small power generation (up to few kW). In this collector, a Fresnel lens which consists of fine, linear grooves on the surface of refracting material of optical quality on one side and flat on the other side is used. The angle of each groove is so designed that the optical behavior of the Fresnel lens is similar to that of a common lens. The solar radiations which fall normally to the lens are refracted by the lens and are focused on a line where the absorber tube (receiver) is placed to absorb solar radiations. Solar power is silent, limitless and free. It is pollution free. It releases no CO2, SO2 and NO2 gases which are produced in coal-fired generating stations. It does not contribute to global warming. Operating costs of solar power plants are very low. Solar electricity is not produced at night. Hence, a complimentary power system is required. Solar power is much reduced in cloudy conditions. It is very location dependent, only suitable for favorable sun-shine sites. Solar power plants require very large ground area. At present, solar power is very costly. Needs a thermal storage system. Thanks for reading about types of concentrating solar collectors. © www.yourelectricalguide.com/ types of concentrating solar collectors.